A family visiting Walt Disney World has always been able to get sidetracked from their attraction mission by one thing, characters. The ability to generate an interaction between a child and Mickey, Cinderella, Dreamfinder, Captain Hook and other beloved characters come to life are often times the photographs and memories most cherished from a trip. I myself clung to my autograph book as a child, back when a wider variety of characters roamed the park with more freedom than they are allowed today. A challenge to these interactions has always been the ability for the characters to interact with the guests. Aside from the face characters, a category populated by a selection of villains and princesses, other characters have almost always had to rely upon gestures to get their points across. In recent years we have seen leaps in the interactive arena stemming from projects like Turtle Talk with Crush, Muppet Mobile Labs and Lucky the Dinosaur, to name a few. In just the past year, we have seen Mickey begin to blink his eyes, move is mouth, and generate conversational speech in a few rare settings and even C-3PO has been getting in on the verbal act. Yet, time and again, the interactive character that seems to get the most discussion is PUSH, or perhaps his Disney’s Animal Kingdom counterpart PIPA, the rolling, rumbling, talking and wise-cracking trashcan, or recycling can in the case of PIPA. While PUSH and PIPA have grabbed some of the limelight, they were not the first in the line of characters with the ability to interface with guests. In the early days of EPCOT Center a little robot GYRO trundled his way around Future World. GYRO would begin talking with a single guest, usually a child, and a crowd of onlookers would usually follow. The conversations would include jokes, trivia questions, suggestions, songs, the pushing up of his hat with his antenna and even carry on a regular dialogue about the child’s experience in EPCOT Center. The 4’10” blue automaton was a favorite of guests, but how did GYRO, and for that matter PUSH and PIPA, operate. The secret is in the character itself. Like all good puppets, GYRO, PUSH and PIPA can distract their audience away from the puppet master who is pulling the strings. In the case of case of our rolling friends, the strings happen to be a microphone and a remote control. While simple in design, the control the guides have over their robotic counterparts is remarkable. Add in a sense of humor and the experience is definitely one for the memory books and home videos. 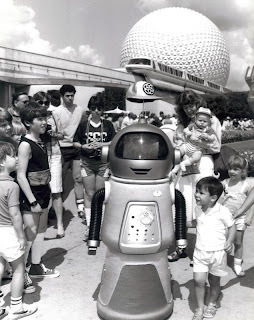 As with the vast majority of early EPCOT Center experiences, GYRO has been retired for many years, but that doesn’t mean we can’t look back on the little ‘bot with a lot of lingering fondness.